Kryosec refrigerated dryers typify renowned ‘Made in Germany’ quality. They provide dependable drying in ambient temperatures up to 122 °F and ensure high efficiency performance through their low maintenance design and the minimal pressure loss heat exchanger system. With their compact footprint they are exceptionally versatile and are ideal for locations where space is at a premium. The dryer’s stainless steel plate heat exchanger is complemented by an air-air heat exchanger. 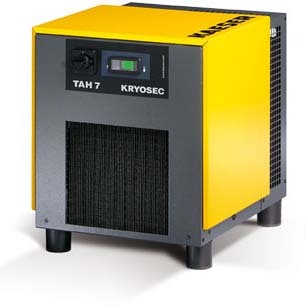 Low pressure differential and high quality insulation ensure energy-efficient operation at all times. The integrated condensate separator provides dependable performance even under conditions with fluctuating compressed air flow. The electronic Eco-Drain 30 condensate drain provides dependable condensate drainage without pressure loss. Cold surfaces are insulated to prevent condensate formation and corrosion from occurring on the inside of the system. A ball valve installed at the condensate inlet enables quick and simple maintenance. The Eco-Drain 31 is also available as an option for all models. The dryer’s generously dimensioned heat exchanger surfaces ensure dependable heat transfer even at high ambient temperatures. Robust fins with barrier-free flow can be easily cleaned as required. The high quality lockable on/off switch clearly indicates the switch position. They are also equipped as standard with an integrated power supply isolating device.